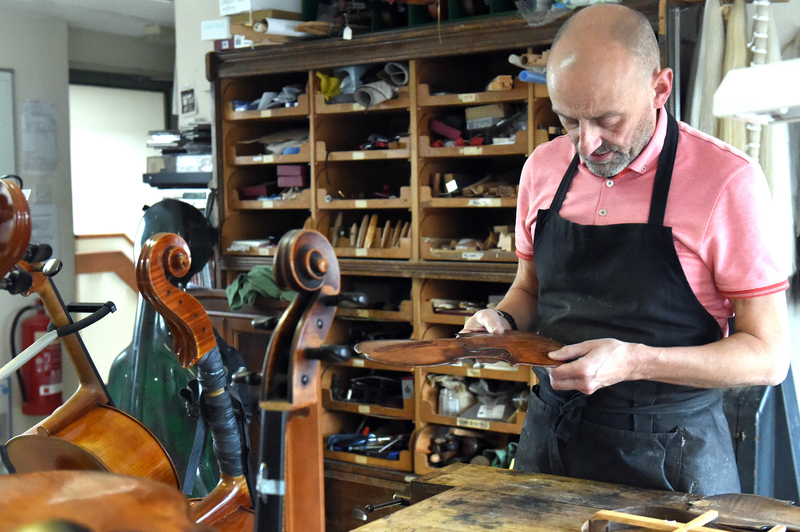 Supplying violins, violas, celli, bows and baroque bows to string players from beginners to amateur players, teachers, collectors and professionals since 1985, Philip Brown Violins offer honest, trustworthy expert knowledge and workshop skills.  We pride ourselves in providing our customers with good, honest advice whether we are recommending which instrument to buy, valuing their instrument or carrying out repairs. We have built up a large client base having been in Newbury for nearly 30 years. We work with young players from the surrounding counties to Professional Soloists and members of all the well known orchestras within the UK and Europe. Our staff are all highly qualified and experienced thereby able to offer reliable advice and service. We carry very good stocks of instruments and bows, representing some of the best of English, French and Italian instruments available. We sell instruments from £600 to £500,000 and offer an approval service for those not sure whether to buy and a rental service for new players. We also always have a good range of bows in stock including 18th century originals. Bows suitable for those interested in period performance are made in the workshop by Philip and the team. We are based in Newbury town centre, above Vodafone (opposite Tesco Metro). We recommend that you make an appointment. Philip Brown is well known and respected within the industry. He also has a great team behind him, so whether you are looking for a rosin for your bow, advice or a new instrument, please don’t hesitate to contact us. 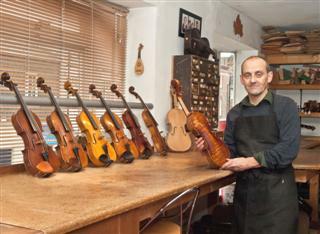 Philip Brown Violins offer honest, trustworthy expert knowledge and workshop skills. 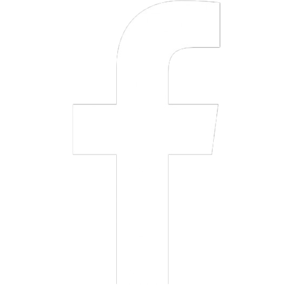 Unlike some violin businesses the staff here are all highly qualified AND experienced thereby able to offer reliable advice and service. Philip Brown (b.1961) decided on a career in musical instrument making from the age of 14 after contact with instrument maker Alan Lamb and the musician/collector Peter Davies. It was the latter’s passion and knowledge of all things strings which inspired Philip to undertake the 4 year course in Lute and Viol making at the London College for Furniture. The workshop had an inspirational teaching team; Roger Rose, Steve Barber, Ian Harwood and Norman Myall augmented with the sharp insights from lutenist Christopher Wilson. Chris worked closely with the students staying behind for hours thrashing out design and historical ideas. It was a steep learning curve but after many late nights and hard graft, Philip emerged as the only student of his year awarded a distinction – bestowed by visiting master luthier Dietrich Kessler, he said to Philip, “looking at your work, it’s really very good so I want you to tell me what’s wrong with it!” Philip gave Kessler a list of things he was unhappy with and perhaps it was that which led to his award. Philip’s fellow students of the time were also an inspiring force, they included Martin Haycock, Tom Neitzert, Gary Bridgewood, Charles Riche, Craig Ryder and Claire Ryder – all of whom have gone on to great things in this field. On leaving the college in 1984, Philip had a healthy order book of instruments to make and this he did in Wapping, sharing a riverside workshop with Martin Haycock for a year before returning to his home town Newbury in 1985 where he continued to make lutes and started working with violins. The violin side of the business grew and grew and has been the mainstay of his work for many years. Philips special area of interest is for English violin and bow makers. To find out more about our specialist time and book an appointment to find your perfect instrument or bow, call us on 01635 35465. Alternatively follow the link.